Why would a brand want to use an app to help build their Instagram or Twitter followers? The better question to ask is, why not? The right apps can help your brand expand its reach and visibility, connect with influencers, hone in on your digital target audience and build your brand awareness. 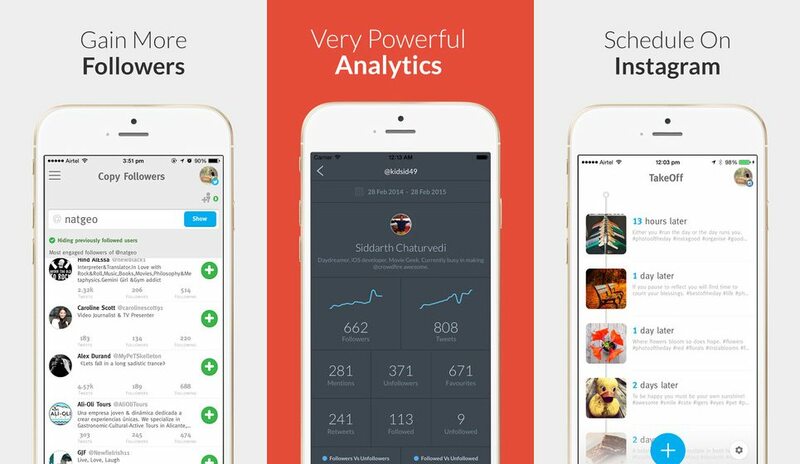 Check out my roundup of the top four FREE apps to get the savvy social media upper hand. What’s not to love? 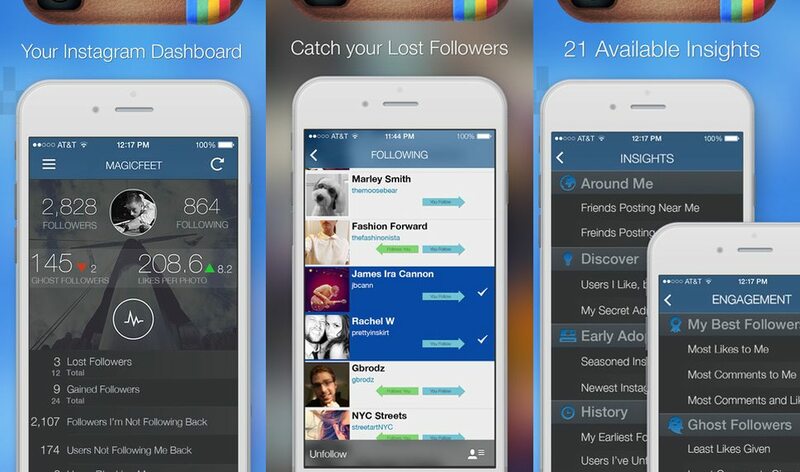 Crowdfire (formerly JustUnfollow) is the love of my life. Well, after Diet Coke, but it’s high on the list. Before I started the research for this blog post, it was the only app I had used for growing my Twitter and Instagram followers. And it’s worked pretty well for me. I currently have 40.5k followers on Twitter and more than 9k on Instagram. It tells me who my “fans” are (people who follow me, but I don’t follow back). This is a great way to see who’s interested in your brand, which can form how you continue to or change the way you serve up content. “TakeOff” is a function that allows you to schedule tweets within the app without having to use another tweet-scheduling platform like HootSuite. The newly released “Stats” function shows you how many mentions, followers, unfollowers, retweets and favorites you got over a certain period of time (yesterday, last week, last month and last year). 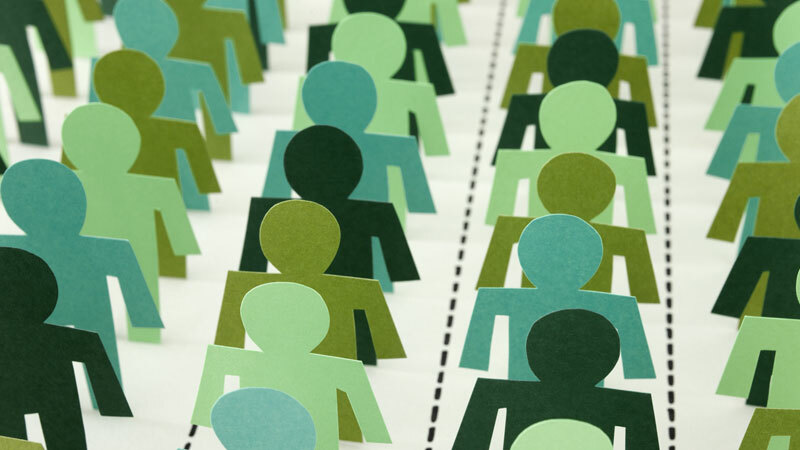 This is key for measuring engagement and helping you tailor your posts to what people are most interested in and are most likely to engage with. 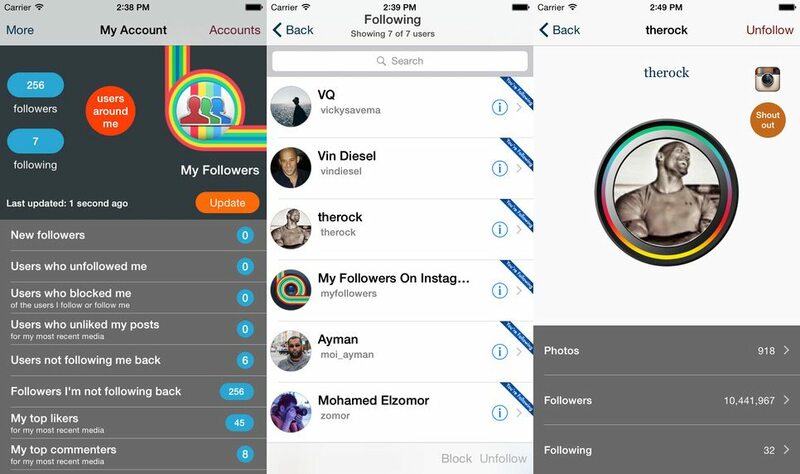 “Copy Followers” allows you to enter any Twitter or Instagram username and start following anyone you select from the list of that particular user’s followers. 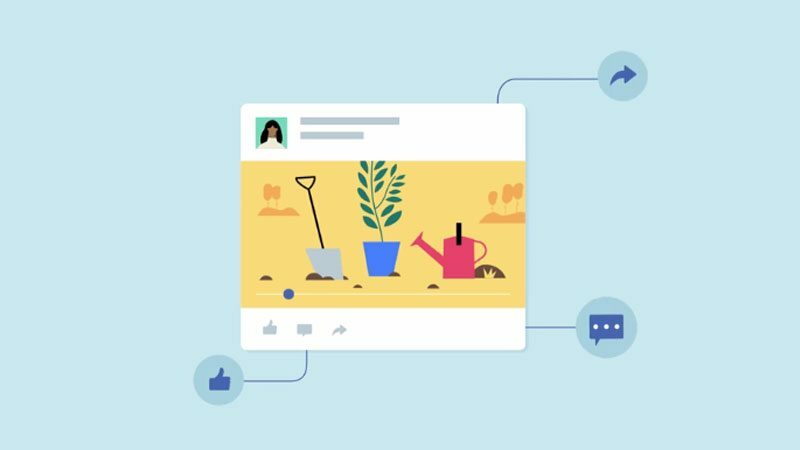 This is a great way—once you identify users or brands similar to yours—to increase the likelihood of connecting with people who’d be interested in your brand/content. Honestly, I don’t really have any complaints about this app. It has all of the features I want. The only thing I will mention that could be perceived as negative is that there are opportunities for in-app purchases. The standard account only lets you unfollow 200 people per day on Twitter (much less on Instagram, around 60). But I purchased the minimum upgrade for $5/year to unfollow as many people as I want each day. That said, you can absolutely have a great experience with this app without paying a dime. Followers for Instagram is very straightforward and easy to use. It has lists of who you’re following, who follows you, new followers, unfollowers, users you’re not following back and users who aren’t following you back. You can easily identify people who have unfollowed you or not followed you back, and unfollow them if you choose. This helps maintain your following-to-followers ratio and can help keep your timeline clean. On the other hand, you can also see who you do not follow but may want to check out these people’s profiles to see if you’re interested in their content. Although this app does provide information like followers and unfollowers, which the Instagram app itself does not, it doesn’t provide much more information than that. The information that the app does have available requires you to pay a nominal fee. 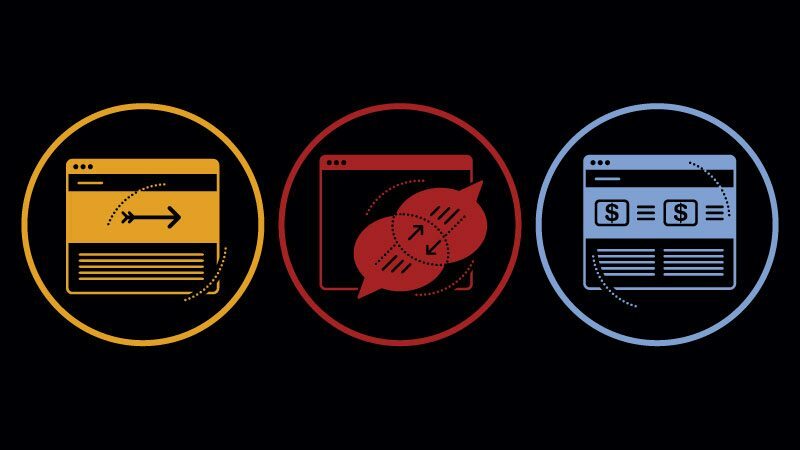 The app also prompts you to “earn free coins” by watching in-app videos (ads), downloading other apps or completing tasks, and then allows you to redeem them for one of three app upgrades (Involvement Pack, Perception Pack, Follow Monitoring). Some people might consider this as an item that belongs in the “pro” column, but I think it’s tacky and doesn’t help with broadening your insights into your audience (or growing it). With a scrolling feature resembling the New York Stock Exchange ticker, Followers+ for Instagram is visually very clean, modern and practical. Your stats scroll across the top, displaying how many ghost followers you have, followers, total likes, photos per week, likes per photo, fame value, acclaim value and photos. This is just a fresh way to showcase the same information available in other apps, but in a more visually stimulating and innovative way. Shows followers gained, followers lost, followers you aren’t following back and users not following you back. As visually appealing as this app is, it doesn’t really have content that’s all that different from similar apps. The in-app purchases are very affordable (99 cents each), however, they’re making you pay for content that’s available elsewhere for free. My Followers for Instagram is a bright and colorful app that’s easy to navigate and contains a lot of great information that some of the other apps don’t. When you click on your “new followers” tab, there’s a “shout out” icon that creates an Instagram post for you, highlighting your new follower. Of course this isn’t mandatory, but people tend to like shout outs, so it’s a nice (free!) addition. You can do an in-app purchase of the “Pro Tools Package,” which allows you to manage multiple Instagram accounts, bulk follow and unfollow users, identify users who unfollowed you before, block users and more for $1.99. 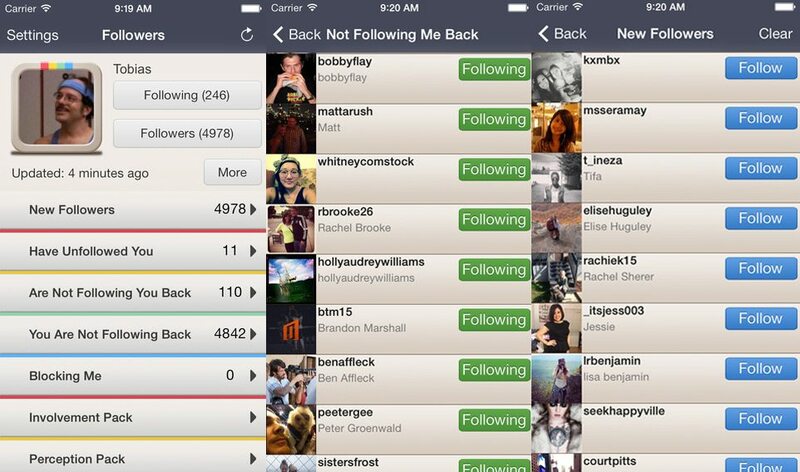 You can click on a username (anyone you follow, users who don’t follow you back and users you don’t follow) and see their photos, followers and who they’re following—right in the app! You can see who your top likers and commenters are, as well as your ghost followers (people who don’t like or comment on your posts). Some of the other in-app purchases (also $1.99) seem unnecessary, like seeing which users blocked you and which users unliked your posts. Under the list of users not following you back, you can click a button to “expose” them on your Instagram. This seems like a juvenile and petty tactic. Very unnecessary.